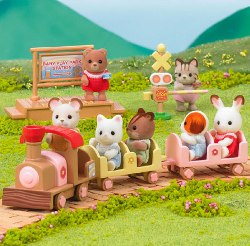 A new addition to the Baby Fairground and Park collection, your Sylvanian babies will love riding around on this fabulous new train ride. With two carriages and space for 5 babies everyone can enjoy a journey on the train. Set includes engine, two carriages, station platform and crossing barrier - and even includes baby train tickets for those who are travelling!